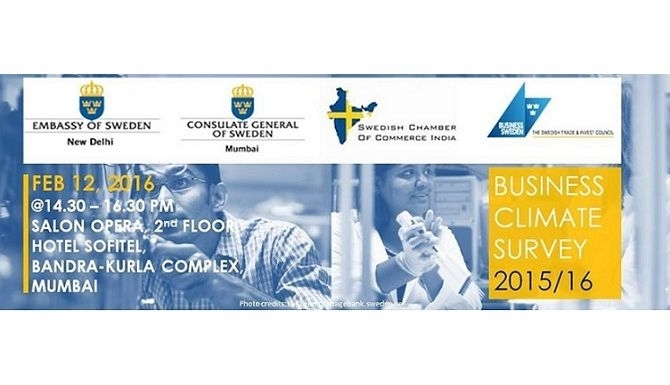 The 8th Business Climate Survey conducted by the Swedish Chamber of Commerce India in partnership with Embassy of Sweden in New Delhi, Consulate General in Mumbai and Business Sweden, brings to light the experience of doing business in India as perceived by the Swedish business community. It provides an insight of the expectations and perceived risks for the future along with identifying the most important areas that have to be addressed. This year's survey captures the input from 141 Swedish companies established in India. Swedish companies have been present in India for decades and generate more than 160,000 direct jobs in India and over 1 million indirectly. The majority of the Swedish companies are established in Delhi NCR, Maharashtra and Karnataka and this year's survey also provides an insight into opportunities and challenges in each state. In the presence of Mr. Oscar Stenström, State Secretary, Ministry of Enterprise and Innovation, Government of Sweden, Ms. Banashri Bose Harrison, Ambassador from India to Sweden and representatives from the Government of Maharashtra the Business Climate Survey Report 2015/16 will be presented on February 12 @14:30 - 16:30 pm in Salon Opera, 2nd floor, Hotel Sofitel BKC, Mumbai. This will be followed by a panel discussion of company leaders from the Swedish business community. During the event the booklet “Sweden Makes In India” produced by the Embassy of India in Sweden will also be presented. Join us to learn the main results of the survey and to hear from some of the industry leaders about their experiences and views of the current business climate and the opportunities of doing business in India. Please confirm your participation through e-mail to sara.larsson@swedishchamber.in or call us on +91 11 46067123/ 4.